"Unexpectedly grand fruits are sometimes forced forth by harsh pruning." - Ch 35. At least, this is the closest I can come to summarizing Hardy's philosophy and why it is perhaps worth reading this lesser known novel about astronomy and two very "star-crossed" lovers. We ought to introduce into common usage the simile "As unlucky as a Hardy heroine" to express repeated and extremely inopportunely timed misfortune. Lady Constantine is (effectively, then literally) a widow in her husband's great estate, which includes an old stone tower that a local young man, Swithin St. Cleeve, has co-opted for use in his astronomical pursuits, and the plot of the book follows the ups and downs (mostly downs) of their romance. There are so many circumstantial set-backs that for a time one can believe all the two lovers need is a break in their run of bad luck until one begins to suspect, closer to the end, that perhaps even if all went well, their internal differences would drive them apart. And this is where, I think, the novel is at its most astute: Lady Constantine is nearly thirty and throughout the book she tends to be more aware of social setting, public opinion, the ramifications of her actions (let us call this the "broad" view), while Swithin, just twenty, is described with his head-in-the-clouds scientific pursuits, but also with what might be called a kind of naive selfishness (let us call this the "narrow" focus). In love, he is more passionate, but also somewhat short-sighted. He tends not to see (or consider) the impact of his actions on others, or foresee future events. This gap between the "broad" and "narrow" seems to me to be a pretty accurate description - at least in my experience - of relationships between women and men, and especially so when there is a difference in age. This is not to say, of course, that this is always the case, just my own general observation, but I think it is the cause of a great deal of unhappiness, particularly in women (or girls) who are young enough not to understand. It should probably be put on high school reading lists, if only for this valuable life lesson. Lady Constantine is also interesting as she pertains to what I would call the "freedom for" question. Like Madame Bovary, she is another literary case study of the ionized heart. They ostensibly have everything (marriage, some social stature in the community, sufficient means to live without laboring), and yet are curiously incomplete. With such needs met, they have leisure, they have freedom, but for what? They don't seem to know what to do with themselves. Often the description is "bored", but I think the boredom is not a surfeit, but an unaddressed longing. They lack purpose, meaning, a compelling passion. It is like an atom which has lost its complement of electrons and is hence charged and highly reactive. As such, they make exciting subjects, ripe for drama - often of the tragic variety - but the existential question behind it persists, for men and for women: freedom for what? One regrets in Lady Constantine's case that she could not fall in love with astronomy, rather than with the astronomer, although Hardy would find it difficult to imagine a woman fascinated by pure science, but whether we can pick and choose what lights up our brains with meaning, what we give our heart to, is an open question, and not nearly, I think, so easily answered as Sartre would have it. We will see this "freedom for" question again - some other extreme examples include Henry James' "Portrait of a Lady" and Ibsen's "Hedda Gabler." It is very easy to answer in the negative - both end with a sense of wasted opportunity; there are far fewer attempts to answer in the positive. Given that the plot of "Two on a Tower" starts to sound like a soap-opera with secret marriages, he-loves-me-he-loves-me-not, and characters receiving improbable letters at the last minute from estranged relatives, why read Hardy? His books tend to be dismal, his rustics are not humorous, his protagonists tend to plod through life weighed down into dullness by crushing societal burdens. Hardy goes to extraordinary lengths in "Two on a Tower" to make Swithin, but in particular Lady Constantine, utterly above reproach: they are the most circumspect, cautious, rational people imaginable. Everything is thought out, argued, reasoned, and the circumstances are arranged so as to make each choice appear to be the best possible. Character is unimpeachable. I think what Hardy is doing is presenting extenuating circumstances in defense of socially unacceptable situations - Lady Constantine finds herself pregnant with an illegitimate child, who is only technically illegitimate because of a mistake in the exact date of when her absent husband died in Africa, and of course, the secret marriage, which has turned out to be bigamous and therefore invalid, and nobody knew about it anyway... When I was younger, I used to glance immediately at a woman's hand when I saw she looked pregnant to see if she was wearing a ring - this is a horribly pompous and judgmental thing and I have no idea why I did it. Later on I realized that pregnant women very well might not wear wedding rings (your fingers swell, weight-gain, etc), and later than that I realized that it really wasn't my business at all. It really is no concern of mine, and it shouldn't change how I act, or even how I look, at a person. Peace be to all - life is challenging enough without judging one another. Hardy is a sort of apologist for Stage 2, and his books have a kind of "oh, she put on extra weight! ", of course she was blameless, and would have been obviously blameless, but there were these unfortunate circumstances that can be explained. It's not as desirable in an author as Stage 3, but it beats Stage 1. "'Better!' said the parson, in the strenuously sanguine tones of a man who got his living by discovering a bright side in things where it was not very perceptible to other people." - Ch 2. The edition of "Two on a Tower" I used is an audiobook from Audible.com for sale on iTunes. It is read by Michael Kitchen. My mother cautioned me once that Bovary should only be read "when one is old enough", and I know of few sayings more certain to entice an irrepressibly curious young person. How will you know when you are old enough? Fadiman (Lifetime Reading Plan, 113, 1988) admits that he finds the novel "cold and depressing." I imagine it helps, but is not necessary, to be married; I imagine it helps, but is not necessary, to be a woman. My reading of Bovary left me convinced it is an absolute gem: a rare and perfect marriage of form and function it would be impossible to duplicate ever again. The genius of Bovary is in its style, which, like a meticulous Dutch painting, continually brings into focus small, commonplace, sometimes sordid details - the stain on a shirt-front, the creases in a boot. Almost always they reflect or reveal some shading of character and create an absolutely real sense of place. Emma Bovary is prone to Romanticism, and trapped within this world of farmers and chemists, dog-carts and buzzing flies. She thinks it is her relative bourgeois poverty, a country doctor's wife of no distinction, but Flaubert's narrative style suggests that there is no refuge, not even among the rich, from the small imperfections, the human foibles, the very particularness that is oppressive to a mind trying to escape its tether. Her husband Charles is cheerfully oblivious: content in his limited sphere of acquaintance and interests, pleased with himself, and comfortable in his country manners and dress. Of course things go from bad to worse - how could they not? Emma is a time-bomb, with no internal discipline to keep her unhappiness and anger in check - but what is truly remarkable is that the novel reserves judgement. 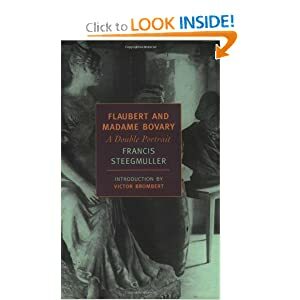 It would have been so easy to produce a sad tale of a misguidedly-idealistic young woman's descent, or, alternatively, to have held her up as a visionary soul surrounded by petty-minded, ignorant and pretentious folk, but Flaubert walks the knife's edge. One of the brilliant aspects of the book, I thought, was that it doesn't begin with Emma and her clandestine dormitory reading of sentimental poetry and exotic Romance novels; it begins with plain, plain Charles, as a somewhat clumsy and thick-headed boy at school, his mother and father's mismatched and unhappy marriage, and Charles' own first marriage to the horrible Madame Dubuc, so there is a kind of diffusion of blame. It is not just Emma, or just Charles, but a more universal difficulty in finding the right match of temperaments suited to making a happy life. Not that all people are equally capable of creating happiness - when Emma finds Leon, who also has a penchant for music and poetry, she merely devours him. It amazes me that Flaubert as a novelist was able to enter deeply into the mind of a woman of his time - particularly in her frustration at being pent up because she is a woman and not as free as a man. And there is the fascinating anecdote that Flaubert once said of his most famous heroine, "Madame Bovary, c'est moi." But then he is also remarkably sensitive in his depiction of the inner life of his other major characters, such as Madame Bovary senior (Charles' mother) and Charles himself. But then this is also the Charles who learns he has a taste for dominoes, and music, and drink, and women, who has to be put back on his task. He has a first, loveless marriage in which he is the one looking for affection, but then also becomes the smug, obtuse husband who cannot glimpse Emma's misery. And there is a rather amazing (gruesome) bit at the end during the vigil over Emma's body, when, after dwelling on his idealized memories of love, he lifts the shroud to see her once more and falls back in horror. Even unimaginative Charles is a romantic when it comes to death, and the novel will not let him. Again, the knife's edge: it would have been easy - it is easy - to be a realist and a pessimist and to take a kind of ugly pleasure in wallowing in the seaminess of life. But the novel is great precisely, I think, because it is careful merely to present, because the only solution to the problem posed by Emma (dissatisfaction, boredom, Romantic disgust for all that falls short of the imagined ideal) is to turn and embrace the present and particular in the spirit of Zen Buddhism. I don't know if Flaubert ever thought of it this way, but reading Bovary made me think about the ways in which my mind rejects elements of its surroundings and tries to slip out the back way, when what is called for is an intensification of focus on the present-immediate. Wash the dishes, fold the laundry, approach Romance novels with caution.